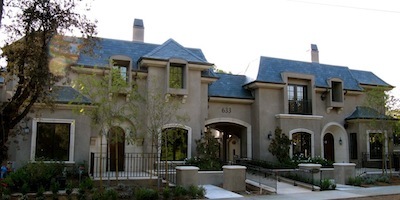 Walking distance to downtown Pasadena’s famous Lake Avenue shopping district, these 12 super luxury (3 and 4 story) townhomes define urban living. Hard wood floors throughout, natural stone, Viking Professional series kitchens, designer cabinetry, high ceilings, fireplaces are but a few of the amenities included in each condominium. The units run between 2,100 and 3,100 square feet. Amenities include hydro-jet tubs, heated master bathroom floors, fitness center, private two car garages and more! Six units include private, quiet hydraulic elevators and a rooftop terrace complete with outdoor fireplace. Six units have solar system support for large reductions in utility bills. Solar panels are also deployed to reduce HOA fees. The two largest units have large home theaters. All units are pre-wired for whole home audio/video, security and Cat5e internet cabling.